Diablo 3 is facing problems from South Korea's Game Rating Board and that's bad news for everyone. 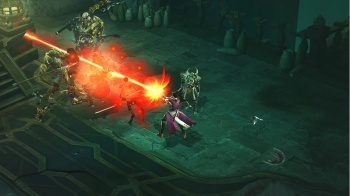 Compared to some of the videogames that make it to market these days, Diablo 3 appears to be relatively tame. It's violent and bloody, yes, but mitigated by a top-down perspective and cartoonish visuals, and you certainly won't see anybody killing hookers for a DIY refund or dropping epic streams of F-bombs in the name of gritty, dramatic intensity. Not that either of those are at issue at this particular moment anyway; the problem for South Korea's Game Rating Board is the presence of the auction house. Gus Mastrapa had a few things to say about the auction house last year but the short, relevant version is that it allows players to buy and sell in-game items and even "cash out" by converting in-game currency to real money. This is a problem for members of the rating committee, who see the option to sell items won in the game as a little too close to gambling. "Committee members are conflicted about what to do with Diablo 3 because of Blizzard's information on the game's 'auction house' feature," a rating board rep told the Korea Times. The game has already been rejected twice and although it was submitted for a third time on December 22 with the cash-out option disabled, the rep said it still looks dicey. "As it is described in the (re)submission, committee members are still reluctant," he added. It's not just bad news for Korean gamers. Diablo 3 is intended to be a region-free, simultaneous global launch, with every country in the world getting exactly the same game and because of that, the delay in South Korea means a delay for everyone. That could change depending on how this plays out, but a Blizzard rep stated that the studio remains committed to a global release "in principle." Concerns that Diablo 3 would violate South Korea's gambling laws first popped up in October 2011, although Blizzard CEO Mike Morhaime insisted at the time that it wouldn't be an issue. "You're not risking anything," he said. "You're just investing your time. It's an important distinction." The previous month, however, Morhaime traveled to South Korea for a meeting with Game Rating Board members, the day after which Blizzard announced that Diablo 3 would be delayed into 2012.